After a disappointing first half with only a few emotions it was Rodrigo Palacio who opened the match with his 4th goal of the season after 3 minutes in the second half. From that moment Genoa was the strongest team in the field till referee Russo decided to give Chievo a penalty and Dainelli a red card. Our goalkeeper Sabastien Frey stopped the penalty by Pellissier, but Mr. Malesani substituted our best and most quick player Rodrigo Palacio (back in the Argentinian National team) by Granqvist which meant that Genoa no longer had any dangerous forwards and allmost all Chievo-players could play offensively. By goals of Pellissier in the 74th minute and Moscardelli in the 93rd minute (30 seconds before the end) the first defeat of Genoa in the season was a fact and we are now 3rd in the standings. Next week we play in Stadio Ennio Tardini against Parma. Tomorrownight at 20.45 hours Genoa plays the 2nd homematch against Catania which team also has 4 points in 2 matches. 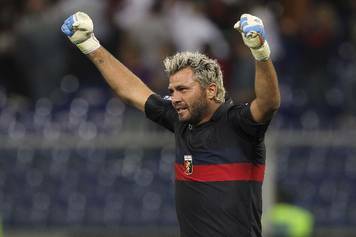 Genoa misses injured Mesto, Rossi and Zé Eduardo, while Birsa, Bovo and Merkel returned in the selection of Mr. Malesani. After the draw against Atalanta Mr. Malesani promised that Genoa would play better against Lazio. Now we can say he was right, unless the fact that Genoa was already 1-0 down by our ex-player Giuseppe Sculli after only 10 minutes. In the first half both teams did not score anymore, but it was already clear that we saw another Genoa than a week earlier against Atalanta. The only negative aspect was the injury of captain Mesto after 22 minutes which meant the Serie A debut of Granqvist. At the beginning of the second half Mr. Malesani substituted Constant by Jorquera and he immediately showed his technical capacities. In the 54th minute he dribbled around several Lazio-players and gave a perfect assist to Rodrigo Palacio who scored the equalizer: 1-1. 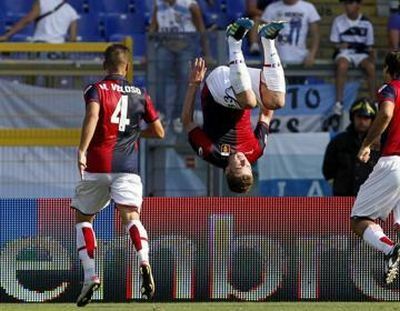 Sixteen minutes later it was Juraj Kucka after a combination with Palacio who scored his first goal in Italy: 1-2. This score was also on the scoreboard after the last whistle of the referee and gives Genoa 4 points after 2 matches. Goalkeepers: 1 Frey, 22 Lupatelli. Defenders: 23 Antonelli, 21 Bovo, 5 Granqvist, 13 Kaladze, 20 Mesto, 24 Moretti. Midfielders: 10 Birsa, 27 Constant, 33 Kucka, 7 Rossi, 14 Seymour, 93 Sturaro, 4 Veloso. Strikers: 99 Caracciolo, 11 Jankovic, 19 Jorquera, 8 Palacio, 2 Pratto, 39 Ribas. Genoa misses 4 players: Alessio Scarpi, Dario Dainelli, Aleksander Merkel and Zé Eduardo, all injured. The whole summer it seemed that Alberto Gilardino of Fiorentina would be our new central-forward. Mr. Preziosi already had an agreement with the player and because of the bad relation between Gilardino and Fiorentina the transfer for everybody was only a matter of time. Unless an offer of € 10 million and Houssine Kharja Fiorentina refused to let Gilardino go to Genova, so Mr. Preziosi at the end of the transferperiod had to buy another central-striker: the 29 years old Andrea Caracciolo of Brescia who scored 12 times in Serie A last season unless the relegation of Brescia. The 1.94 meters tall player with the nickname: Heron has to battle with Pratto and Zé Eduardo to be in the line-up. 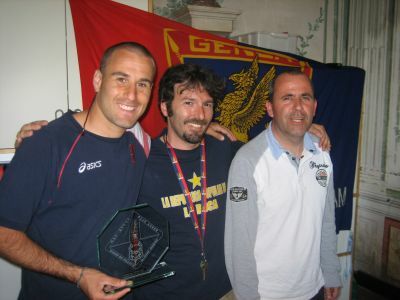 During the handover of the trophy Genoa Club Amsterdam Genoano of the year we heard that Rodrigo Palacio would stay the rest of his contract that ended in June 2013 with Genoa and afterwards he would return to Argentina. This summer Inter did everything to buy Rodrigo Palacio and at the last day of the transferperiod they offered € 10 million to Mr. Preziosi who refused. Rodrigo Palacio stays with Genoa and last week he enlarged his contract with 1 extra year till June 2014. The strike of the players in the Serie A is over. Lega Calcio and the players union made a temporarely deal to the summer of 2012 which means that the new season start at Friday 9th September with Milan-Lazio. Two days later on Sunday 11th September Genoa starts in Luigi Ferraris against promoted Atalanta. The first half the stadium will be completely silent to protest against the players-strike 2 weeks ago at the 1st round of Serie A.